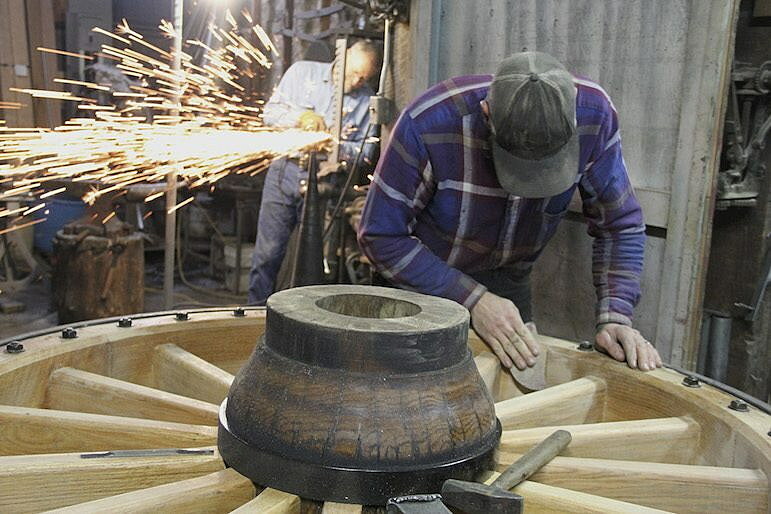 JOLIET — Dave Engel has been making and restoring wagons, coaches and other horse-drawn conveyances for almost 40 years, but the commissioned project he’s working on now is likely to be seen by far more people than anything else he’s done. Working out of Engel’s Coach Shop on Joliet’s Main Street, just off Highway 212, Engel and one employee have been laboring since last February to build replicas of two of the wagons once used to haul borax in California’s Death Valley. The massive wagons, made entirely of iron and wood, will be hauled by 20-mule teams in the Rose Parade preceding the Rose Bowl game—among the best-known games in college football—in Pasadena, Calif., on Jan. 2. The parade is televised around the world and watched by millions. And on Jan. 20, the mule train and wagons will be California’s official entry in the Presidential Inaugural Parade in Washington, D.C., which will proceed from the Capitol to the White House after the swearing-in of the nation’s 45th president—whose name, in case you hadn’t heard, is Donald J. Trump. The Death Valley Conservancy, a nonprofit organization that works to promote and support Death Valley National Park, commissioned Engel to build the wagons. The last time one of the famous wagons and 20-mule teams took part in an inaugural parade was 100 years ago, in 1917, when Woodrow Wilson was sworn in for his second term in the Oval Office. Engel’s wife, Diane, said the conservancy originally wanted Engel to build the two borax wagons and the water wagon that traditionally brought up the rear, but the third piece will have to wait. And she’s not exaggerating. Diane said her husband has been working from 7 a.m. to 10 p.m. Monday through Friday, and then, after taking Saturdays off, generally works at least half a day on Sunday. His assistant, 38-year-old Calvin Roorda, has been working five 10-hour shifts a week. Engel, 62, and Roorda, are building every component by hand in a 5,000-square-foot shop crammed with antiquated machines, hand tools and materials. 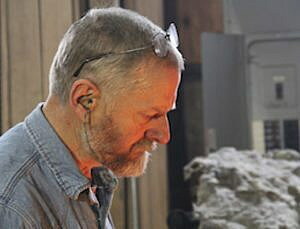 Sometimes Engel uses a propane torch to heat the iron for shaping, but for the big jobs he has a forge fired by blacksmith’s coal from West Virginia and Pennsylvania, which burns hotter and cleaner than typical coal. When complete, each of the wagons will weigh about 8,000 pounds and will be able to haul 10 tons of borax, a mineral used in detergents, cosmetics and other products. Much of the weight is in the wheels, which is what Roorda has mostly been working on. The two front wheels on each wagon stand a little under 5 feet high and weigh 750 pounds each. The two rear wheels are 6½ feet tall and weigh 1,050 pounds each. The wagons are made of poplar and ash, while the wheels are made of red oak, with white oak on the hubs. The original borax wagons became famous in the late 1900s, when the Pacific Coast Borax Co. began selling various products under the 20 Mule Team Boraxtrademark. The wagons were used to haul borax from the mine in Death Valley to the nearest rail spur 165 miles away. The brand, which still adorns products sold by the Dial Corp., became even more famous with the advent of the “Death Valley Days” television series, which ran from 1952 to 1975, and which was hosted by Ronald Reagan in 1964-65. The show was sponsored by 20 Mule Team Borax and each episode began with a film clip of the 20-mule team and wagons, followed by a testimonial for borax products. Diane Engel said the Death Valley Conservancy found the Joliet shop through its long association with Idaho muleteer Bobby Tanner, who knew Engel and his work. The conservancy flew the Engels down to Death Valley two years, but the project didn’t get the final go-ahead until last Feb. 1, which is why Engel and Roorda have been working overtime ever since. Engel got into making and repairing coaches through his brother-in-law, Rick Bischoff, who had taken a wheelwright class and opened a shop in Joliet in 1979. They both worked out of a small space in the back of what is now Engel’s Coach Shop, until the front, then used for storage, came up for sale. Engel didn’t have any experience as a wheelwright or coach maker as such, but he enjoyed metal and woodworking classes during high school in Bozeman, and he grew up around horses and wagons. His parents were Mennonites, he said, and they always had horses on their property outside Bozeman. He remembers his father letting him drive a two-wheel racing sulky, or cart, when he was barely 10, and later he drove a wagon known as a Democrat, a two-wheel, four-passenger spring wagon. Engel started running the shop by himself in 1982, when Bischoff opened his own specialty business in Joliet—the Luminary Shoppe, which now bills itself as the only full-time carriage lamp shop in the United States. Engel, who said he basically learned everything he knows on the job, admits that some of his early work was not up to his current standards. Referring to one of those Yellowstone coaches, he said, “I had an opportunity to fix the original one 25 years later and I was embarrassed”—so embarrassed that he ended up rebuilding the whole thing. And he has had to learn not only woodworking and forge work. He also does all the detailed painting himself, as well as the sewing on the upholstery and the carriage tops, including collapsible folding tops. Along the way, Engel has had a few brushes with Hollywood, doing wagon work for the movies “Far and Away” and “3:10 to Yuma.” Working on “Far and Away,” the Tom Cruise-Nicole Kidman movie filmed partly in Billings, was particularly intense, because on more than one occasion the moviemakers would wreck a wagon one day and need it repaired and ready for shooting again the next morning. Engel has never lacked for work, mostly doing restorations and building everything on custom order, and at one time he had several employees. He had visions of growing ever larger and becoming a big success, but he eventually had a change of heart.